ALL MEMBERS: Please try to attend. 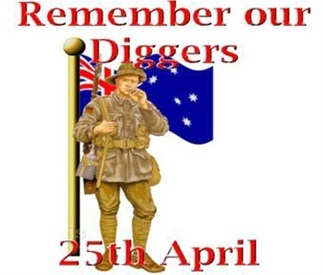 Where-ever you are on ANZAC Day - have a good time, and keep safe. It provides checklists of what needs to happen should death occur. Many of our veterans are reaching a stage in life where they may have to consider the impact that bereavement could have on their family. Planning Ahead addresses these possible impacts by giving veterans the opportunity to document information so it may be accessed by family at a future date. 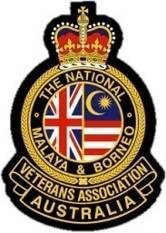 This is the official badge of : NMBVAATASINC, NMBVAAQLDINC, & NMBVAANSWINC - members of the Incorporated States. The Malaysian Palm Oil Association has constructed a Monument and Gallery at Sungei Siput Estate, Perak, formerly known as Phin Soon Estate. Three Estate Managers in this area, Allison, Christian and Walker, were murdered by guerrillas of the Malayan Communist Party on 16JUN1948. The graves of these managers are located at the graveyard of Holy Trinity Church, Batu Gaja, 25 Ks from Ipoh. The graveyard is generally known in the area as "God's Little Acre". Memorial services are held there as close as possible to 16JUN, usually the Saturday beforehand. Upkeep of God's Little Acre continues to this day, and the MPOA (Planters Association) are always grateful to receive donations in this regard. Very well set out and good reading.